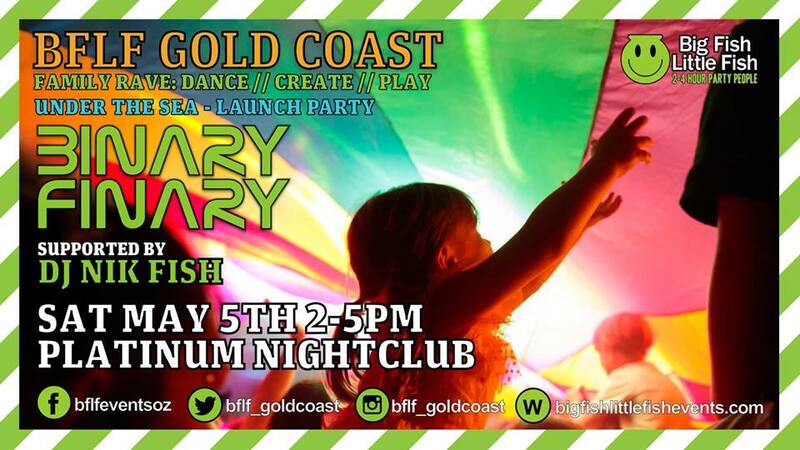 Gold Coast are you ready for the Launch of Big Fish Little Fish family rave? Hot off the heels of the incredible Brisbane launch party we are thrilled to be bringing this wonderful concept to Gold Coast families at Platinum Nightclub, Broadbeach. Award winning, world famous Big Fish Little Fish will launch in The Gold Coast with legendary UK trance act Binary Finary! playing all your favourite Trance Classics. Binary Finary shot to fame after their classic belter ‘1998’ became the first electronic dance trance track to enter the UK Top 30. It climbed to Number 1 and a decade and a half later it is still one of the greatest uplifting trance tracks ever to grace a dance floor. Binary Finary will be supported by Sydney Rave Legend Nik Fish who will be playing an old skool rave set. Dive in as our first event takes you deep under water with the theme – ‘Under The Sea’. Dressing up in your best underwater themed outfit is optional but highly encouraged! Maybe a mermaid, a shark or even a pirate. Packed food and snacks are allowed into the venue.